Rafa didn't have an extended break with his mates. 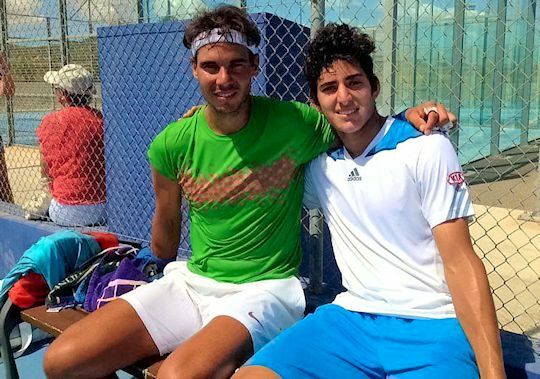 By July 15 he was hitting the hard courts in Manacor and "Back to training with great enthusiasm!" Plenty of fans have been tweeting pictures (including some tantalising shots in a sleeveless shirt which are fuelling the rumours of a return to those for the US Open) and on July 17 the media turned up. Anchor: Rafael Nadal has been preparing himself for his American swing; last year he won 3 tournaments there and he defends all the points, but world #2 doesn't think about his ranking. Rafa: Both for me and for Federer, our ranking is not even a goal nowadays, our goals are tournaments. 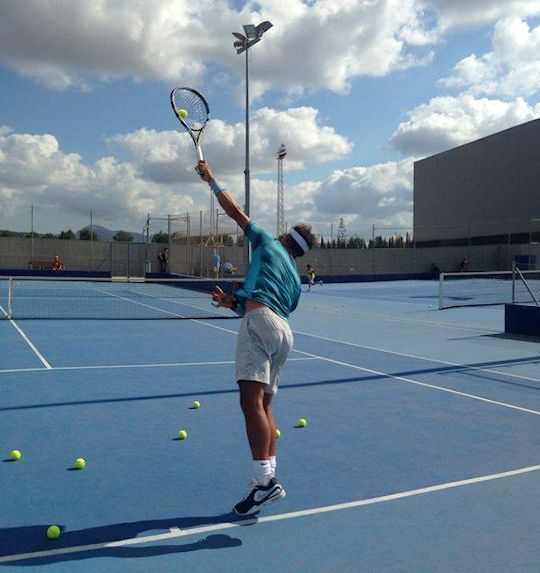 Anchor: Rafael Nadal is back at work, it was his 4th practice session this week. His free days are over, his first tournament will be Canada Masters 1000 in Toronto and the big event of this part of the season will be the US Open. Rafa: I've not much chance to stop thinking about it, because you never have 4 months of holiday, you have one week or one week and a half, and then you're back to thinking about what you need to do, because you need to do it well and you don't have much chance of disconnecting completely. Rafa: When you have several days without playing, you need to start little by little in order to get the feeling, increasing it each day; from now on I have 2 weeks to prepare myself to play at a good level. Rafa: I'm not going to win all the points, neither am I obsessed by that, nor worried; if I don't get these points, I'll be #4 or #5 or #2 in the rankings. Another video, from the same day, with a short interview with Toni Nadal. He had a short break to go to Francis Roig's wedding and took a little time off to play poker. You can read nou.amic's excellent translation of Federico Marín Bellón's Blog about the game. A few days ago, Rafa posted this picture on his facebook page with the message, "Great training session with Christian Garin in Manacor."